I found this article from slow-chinese.com. If you have followed my blog, I believed you should have known at least 70% of the words in this article. So if you can understand this article, try to write the article in English at the comment section. “一边……一边……” is a correlative adverb, usually used before verbs to indicate two actions happen together. The teacher wrote a“宀” on the blackboard while he was speaking. “然后” in “A，然后B” is a conjunction with the meaning of“ then, afterwards”, normally used to indicate an event that occurs after another. Then, she wrote a“女”under it. “如果” indicates an assumption. “就” introduces certain results or consequences. “如果……就……” is used to connect two clauses. If there is a woman in the house, it will be safe and sound. Have you been to Tian’anmen before? Do you know what 安means? Have you been to Tiananmen Square? Do You know what the Chinese character “安” means? One of the students answered: “trouble!” They all laughed. The teacher smiled and said: “If there is a woman in the house, it means peace. Therefore, the character ‘安’ is written as ‘宀’ with ‘女’ under it. hello, again I forgot where I left the comment about hiding pinyin. I’ve read your reply anyway and forgot to reply you back. 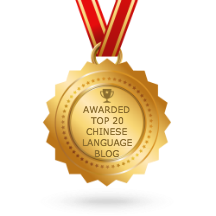 You can post your general comments at http://www.learnchineseeveryday.com/about/ next time. So you can search them easily. Even though I don’t know what you are writing, but thanks for your Arabic translation. By the way, it is “翻译” not “发音”.